ramlila ground is not available for procession and govt/police are refusing permission for any procession /assembly for such large number and taking various factors into consideration AIBEA has decided to defer the morcha on 14th. This would create lot of inconvenience to our units and members. But we felt that deferment is more expedient than going there with total mobilisation and facing problems. 2. 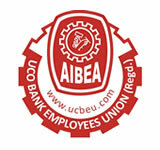 AIBEA office bearers meeting: A meeting of the Office bearers of AIBEA will be held at Delhi on 14th March to discuss the emerging developments in the banking industry and other issues before us. All are requested to attend this meeting without fail. 3. Conference in Srilanka: 10th National Delegates Conference of Ceylon Bank Employees Union, Srilanka is being held on 21-22, March, 2016. We have nominated Com. PP Varghese (leader of our Delegation), Com T Ravindranath, Com Ajay Manjrekar, Com. P V Krishna Rao and Com C S Venugopal to attend this Conference on behalf of AIBEA. 4. My visit to Hanoi, Vietnam: The Presidential Council meeting of WFTU is being held at Hanoi, Vietnam from 5th to 6th March, 2016. Hence I will be leaving Chennai on 3rd midnight and return on 7th night.